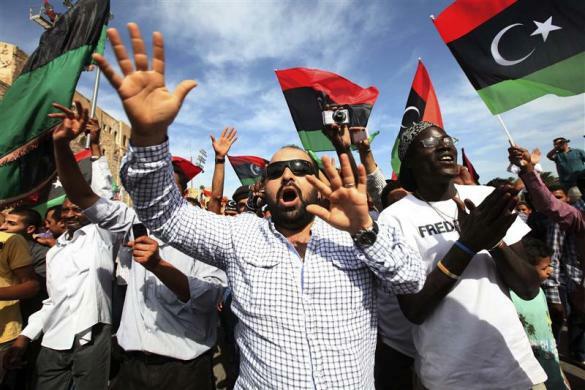 With Qaddafi Gone, Can Libya Overcome the “Resource Curse”? Libyans in Tripoli's Martyrs' Square celebrate news of Qaddafi's demise. What do you think? Does the resource curse provide a convincing explanation for the persistence of autocratic regimes in the Middle East and North Africa? Or is this an overly simplistic argument? What is the likelihood that Libya’s new leaders can create a democratic and prosperous state, and why? A fascinating proposal was advanced by Martin Sanbu and Nicholas Shaxson in on Financial Times last week. In an op-ed piece, they advocate that countries which rely extensively on extractive industries distribute the revenues from those industries directly to their citizens, then tax the citizens to secure state revenue for infrastructure development. The proposal is an attempt to address the resource curse often associated with resource-rich countries like Nigeria, Angola, and Saudi Arabia. Countries which rely on resource extraction (usually but not always oil) for the vast majority of government revenue tend to be undemocratic and often very poor. The paradox, according to many observers, is that despite having extensive resource wealth, there is little incentive for the government to be responsive to the people. Consequently, revenue from resource extraction tends to be captured through corruption. Mineral wealth, similarly, seems to correlate with civil war; countries with extensive mineral wealth (like the Democratic Republic of the Congo) tend to be more likely to experience civil war than less resource-rich neighbors. The problem, according to Sanbu and Shaxson, is that when the state earns its wealth through resource sales rather than taxes, there is little incentive for them to respond to the demands of the people. And because they do not pay taxes, there is little reason for the ordinary citizen to believe their government should be accountable. Today’s prosperous democracies became what they are because their rulers taxed the population to finance government, forcing them to grant the people a share in power. “No taxation without representation”, and vice versa: mutual dependence underpins a social contract. But resource-rich states tax extractive companies, not citizens. When citizens lack leverage, the social contract withers. Our proposal is the only policy that directly addresses this power imbalance. It is automatically transparent: people can see what is in their hands. An interesting—if potentially difficult to implement—solution.